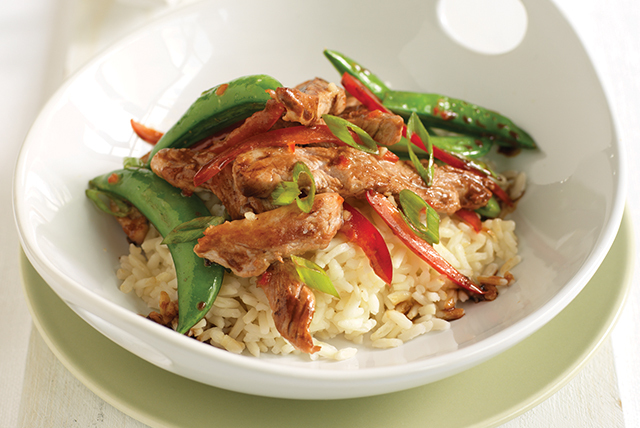 Tender pork and an Asian-inspired sauce make this stir-fry a must to put in your dinnertime rotation. You'll feel good about serving this smart dish. Meanwhile, heat dressing in large skillet on medium-high heat. Add meat; cook and stir 2 min. Stir in peppers and peas; cook 3 min., stirring frequently. Add onions; cook and stir 1 min. Mix soy sauce, cornstarch and ginger until well blended. Add to meat mixture; cook 1 min. or until thickened, stirring frequently. Serve over rice. Omit soy sauce, cornstarch and ground ginger. Cook meat as directed, substituting KRAFT Asian Toasted Sesame Dressing for the Italian dressing. For a spicier flavor, add 1/4 tsp. crushed red pepper to the soy sauce mixture before cooking as directed.